So far, I’ve acquired the set of materials which will make up the main elements of my sculpture. Note that they’re all hang-able items, which will probably be useful when building the final object, since the overall layout will involve branches, from which the objects will be suspended. I also have two fans and a pile of lucky money envelopes, along with some red string to suspend them. As for the prototype, I wasn’t able to acquire any kind of base materials, so I hung the objects I could from my coat-rack, in what ended up being a fairly good approximation for what I’d want my final design to emulate. Of course the extensions would be longer, and less vertically spaced, with more branches extending from the top rather than along the sides. 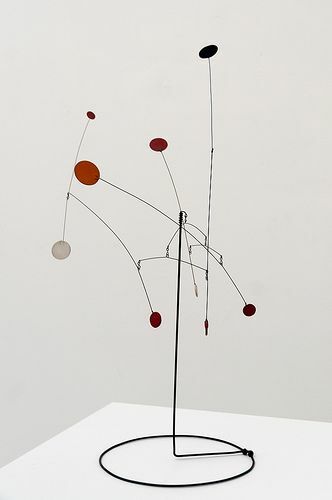 Again, I’m still basing my artifact on the work of Alexander Calder. I like your combination of the kinetic sculpture with the Asian decorations. I think you need to think more about how they are all going to fit together and balance each other out since they are so light. I can see what you are planning to do in your sculpture. I like the idea and I think it is going to look very good. Good luck. I like your project idea. I think that this could be a really cool sculpture if it is able to actually move using a small initial push. I really like the dynamic aspect of this project. I also really like how you chose a stand over an aerial piece. I think an aerial piece would be too much like a ceiling fan aesthetically. Xavier, I like the traditional Asian aesthetic along with the Calder inspiration. Making the different masses balance should be pretty straight forward and there could be some very interesting math associated with the static balance of the different pieces. Nice job. Also thanks for the Tron movie suggestion in my project. The challenge is how to balance those things while the base stays stable.